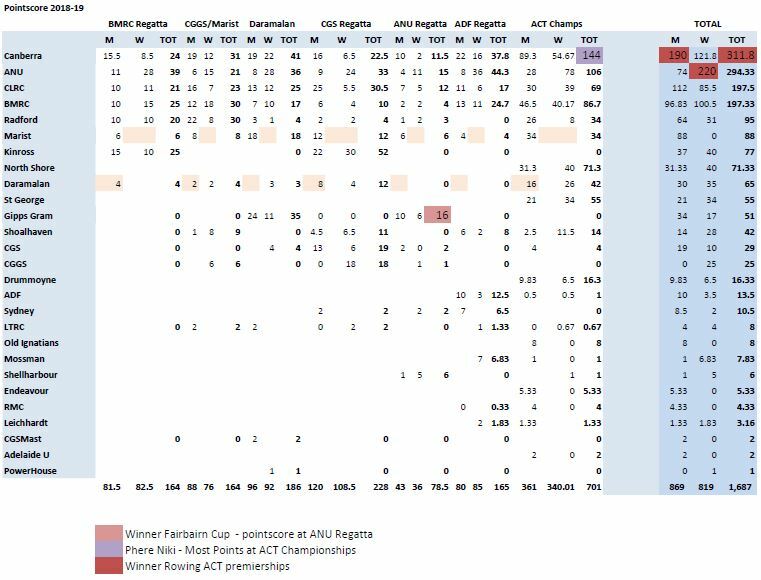 View the final Rowing ACT 2016-17 Premiership Point Score. View the final Rowing ACT 2015-2016 Premiership Point Score. View the final Rowing ACT 2014-2015 Premiership Point Score. View the final Rowing ACT 2013-2014 Premiership Point Score. View the final Rowing ACT 2013-2012 Premiership Point Score. 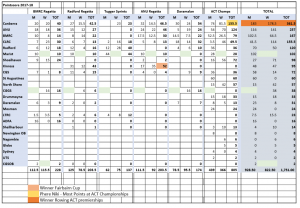 View the final Rowing ACT 2011-2012 Premiership Point Score. View the final Rowing ACT 2010-2011 Premiership Point Score. 1. Points only to be awarded to crews judged to have finished 1st, 2nd or 3rd in each event. 2. Points have only been allocated to races where there are 3 or more crews competing from two or more clubs, except in the case of eights where points have been allocated to races with two or more crews from two or more clubs. Should a crew scratch from such a race following the final draw points will still be awarded. 3. When two or more crews from the same club finish in any of these positions, points shall only be awarded to the first of such crews. 5. For Non-championship events points are allocated to crews judged to have finished 1st, 2nd or 3rd in each event. 6. Composite crew point split. Each club making up a composite crew receives the appropriate proportion of points (ie if two clubs, half the points each, if three clubs, one third of the points each). 7. Mixed crew point split. Mixed crew points are split between male and female point scores. 1. Each participating crew is awarded 4 points. 2. Points are allocated to place getters within each category final. 3. Guide lines number 3 and 7 from above are applied to the Lake Tuggeranong Regatta.